Over the years I have watched thousands of clients undertake a job search. To some it comes naturally; they work with me or other Career Coaches to devise their plan and away they go embarking on a new journey where one of the key attributes is patience. Others struggle and their patience becomes thin and noticeable to career influencers, in particular, during networking meetings and the interview. For the last 3 weeks, I have driven twice a day past a field observing a Canada Goose sitting patiently on a nest within 20 feet of the road. I have never seen her leave the nest. She is acutely aware of her surroundings and watches the never ending traffic passing so close to her homestead. She shows tremendous patience, sitting through rain and sun, night and day with little to think of but the impending hatching of the eggs. How great is it to have her patience? How does this relate to a job search? It is the job seekers who are more patient and diligent who uncover opportunities and steer successfully to their end goal, achieving a new job versus the impatient job hunter with minimal concentration and a lack of direction. 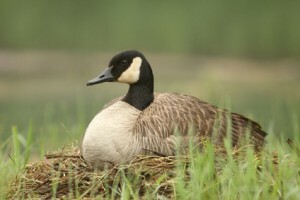 As a job seeker you can learn a lot from that Canada Goose, nesting alone in the field. The job search process can be lonely, challenging and can test your emotions. People who embrace patience and conquer the fear of rejection sign a job offer faster than those that don’t. Do you have the patience of a Canada Goose?